The north of the Rhone Valley shelters eight small appellations, all of them are equally renowned. The total area covered by these appellations is 3,600 hectares. Christophe Pichon makes wine from a total of 18 hectares; the vineyards are spread over the appellations of Condrieu, Côte Rôtie, Cornas and Saint Joseph. For more than 25 years now, Christophe Pichon has endeavoured to bring you fine, elegant wines, reflecting prestigious terroirs such as Roche Coulante for his white wines or Côte Blonde for his red. The next generation joins the estate. 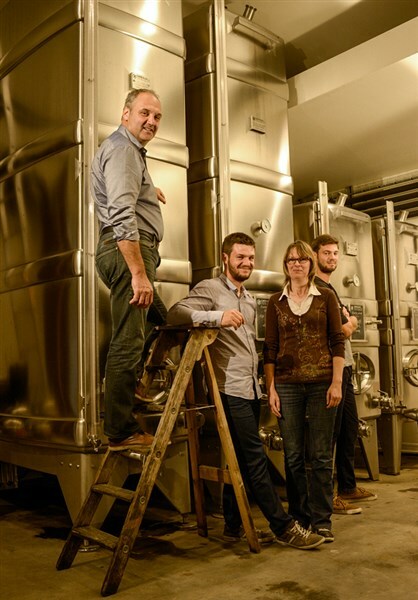 After finishing his studies in viticulture and oenology, Corentin joined the family estate in 2012. In 2014, he spent 6 months vinifying the Syrah grape variety in Australia, in the well-known Barossa Valley region. On his return to France, he began vinifying his second vintage for the same year ! As a result of his broad experience, he refines the vinifications in complete harmony with the estate's way of thinking and maintains the respect of the vines and the wines. For example: making white wines without sulphites. As for Alexis, he is gradually discovering all the different steps of wine-making, from working in the vineyards to the cellar, before acquiring more experience in the commercial activity of the estate. Alexis also hopes to spend some time abroad both to improve his English and to discover other wine producing domains. Learning about different cultures for producing and selling wine will broaden his experience.